Monday through Friday, 6 a.m. to 2 p.m.; Saturday, 7 to 10:30 a.m.
Counter-side breakfast at Pat's Coffee Mug. South Clinton Avenue, straddling the border between Rochester's South Wedge and Swillburg neighborhoods, has evolved into a multiethnic restaurant row, with more than a dozen diverse eateries lining the three-quarter-mile strip between Alexander and Linden Streets. Among these are three long-standing diners, two of which I'd dined at often, and one -- with a time-worn sign hanging over the sidewalk -- that I'd only driven past hundreds of times with squinted eyes and a curious sideways glance. There are many venerable diners I look forward to writing about, but was secretly pleased when my editor suggested I check out Pat's Coffee Mug for City's next installment exploring local diners that have established themselves as institutions in our community. This was the push I needed to investigate this joint that had long been a mystery to me. After three visits, I can conclude that Pat's is not mysterious, and there's much more to it than meets the eye. 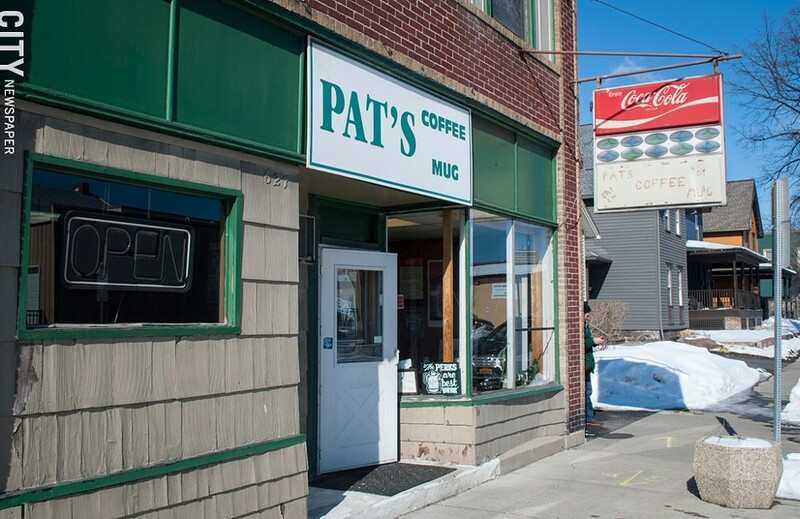 From the road, Pat's appears to be a narrow space tucked behind a storefront. Walking in reveals a greater expanse with a homey sort of shabby chic: A classic counter area adorned with whimsical signage, handwritten notes, a bevy of foreign currency taped to a cooler, a vintage mint-green Hamilton Beach milkshake mixer (alas, no milkshakes in February), and about ten stools, each in front of a winter-themed placemat. Two more rooms contain a mix of different-sized tables and booths, their paneled walls embellished with an eclectic assortment of framed posters of professional athletes, Winnie the Pooh, and the Cincinnati Zoo. It's the customers, however, that truly make this diner homey. On my first visit, listening to my server, Debbie, address much of the clientele by name, I quickly gleaned that this is a place people show up to regularly. Pat Hall, the eponymous owner, who is Debbie's mother (whom many regulars also call "Mom"), says that it's the familiar intimacy that has enabled her to stay in business since 1992. "We've made a lot of friends here" she says. "Regular customers are like one big family and we treat them like that." Debbie adds, "People just feel at home here; it's very comfortable." Most days it's just Pat in the kitchen and Debbie behind the counter and at the tables, both of them busting it for their guests. I would argue that simple, solid, straightforward food, prepared with care and offered at fair prices also contributes to Pat's success and longevity. Pat's offers such things as homemade soups, their popular goulash (on Wednesdays), and meatloaf (Thursdays -- "It sells out quickly," Pat warned me), fresh haddock (Fridays), and "world famous" home-baked cookies. Nothing on the breakfast or lunch menu exceeds $7.95 (note that Pat's accepts only cash for payment). I started my first meal with a bowl of chicken-barley soup, a rib-sticking potage that was piping hot with oodles of barley, chunks of chicken and potato, and a few peas and carrots. It was a bit on the bland side, but nothing that a judicious use of salt and pepper couldn't help. I followed with a delectably messy Mugsy Burger (the provenance of the name is a bit nebulous): lettuce, tomato, onion, bacon, cheese, Rochester-style meat hot sauce (more pungent and less sweet than many) on top of a hefty burger, enveloped by a fresh sesame seed roll. An ample serving of crinkle-cut fries complemented the dish, golden with crispy exteriors and tender innards. And Debbie didn't flinch when I asked for brown gravy on the side. This was consistent with the affable way she interacted with everyone. My whole tab (prior to tip) came to $10.21. 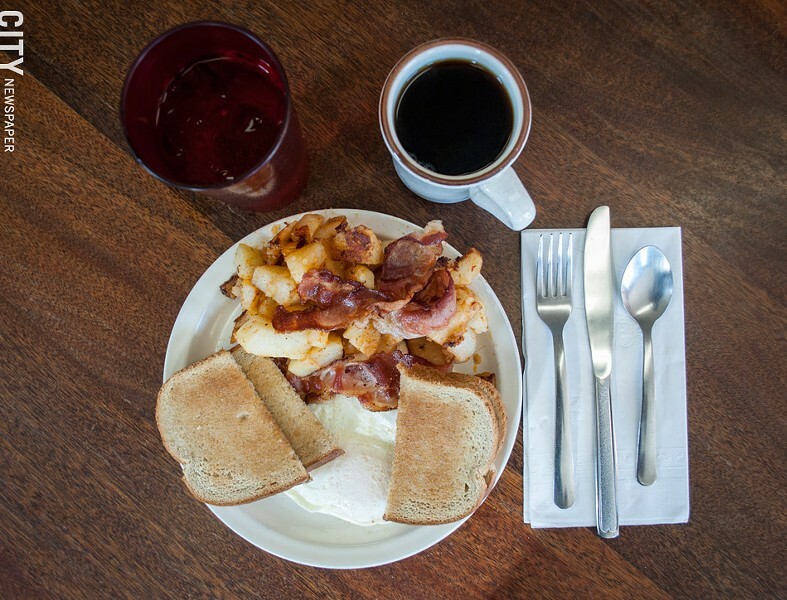 Two eggs over-easy, rye toast, bacon, and home fries at Pat's Coffee Mug. Breakfast at Pat's Coffee Mug is about as pretense-less as meals get. It is what it is, and it starts with bottomless mug of hot, potent coffee, thanks to Debbie's punctual pouring. I ordered two eggs over-easy, rye toast, home fries, and bacon. I like my home fries crispy and crusty, and I usually specify this, but neglected to request that this time. I received them softer than I like, but again, Debbie courteously accommodated me without the slightest hint of an eye-roll or sigh -- something we've experienced in lesser establishments. The home fries came back hot and crisp, and accompanied my runny eggs and crisp-but-not-brittle bacon exquisitely, especially once adorned with Frank's RedHot. My girlfriend Molly had French toast for her meal, and declared it "French toast in its purest form -- simple, straight-up, browned, just as I requested." Our total for breakfast for two was $11.71. My final research-based meal (but definitely not my final meal at Pat's) was another lunch. This time I sat at the counter to enjoy the camaraderie, including that of a colorful character named Bill, who sat at the end of the counter each time I ate there, and who told me (among other things) that he'd been coming to Pat's regularly since 1993. I enjoyed a bowl of pleasantly briny New England-style clam chowder that was neither too thick nor too gelatinous -- a potential pitfall with this soup. I followed that with a Turkey Deluxe sandwich: a mountainous stack of freshly-roasted turkey breast on a hard roll (Pat called out from the kitchen to ask if I wanted my roll grilled -- I did) with lettuce, tomato, and mayonnaise. It was sloppy to eat, thanks to the abundant turkey, but far be it from me to complain about that kind of deliciousness. This lunch came to $7.02. Pat's Coffee Mug thrives as it epitomizes what many people seek in a local diner: conviviality, familiarity, and home-cooked food that gratifies without burning holes in your stomach or your wallet. 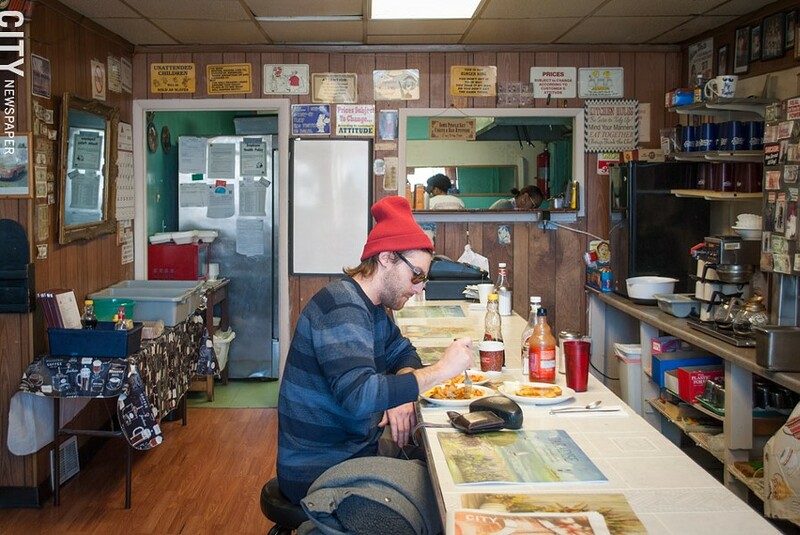 Pat's has been a staple on the border of the South Wedge-Swillburg neighborhoods since 1992.